Lifework Strategies is keeping our “official” records and they just sent me the results of our midpoint screenings. 89 participants completed both the baseline and midpoint screenings. 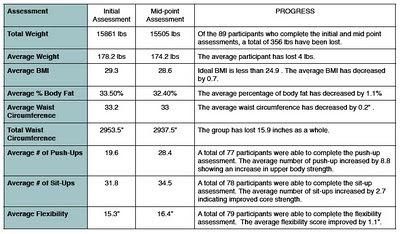 They have recorded a total weight loss of 356 pounds or 4 pounds per participant. Here are the results of the other statistics we collected at midpoint. I’m not confident in the validity of the waist circumference. There seemed to be inconsistencies in the measurements. For example, a coworker’s waist measurement increased 3.5 inches from the baseline to the midpoint screening then dropped 3.5 inches in the next week. In an earlier post I talked about the looseness of the standards applied to sit-ups and push-ups during the initial screenings. I think Lifeworks Strategies set a standard and held to it much more consistently at the midpoint screenings, so any progress achieved in these measures may be understated. We also took blood pressure readings at the midpoint assessment and these results are encouraging. Interestingly, our self reported weight loss numbers are slightly higher. We have 96 individuals self reporting their weights weekly. 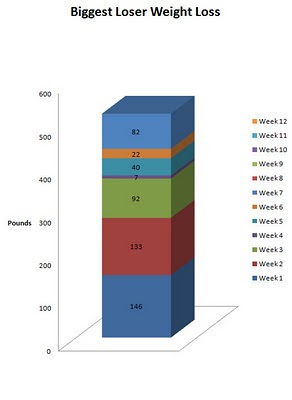 According to those records our Biggest Losers lost a total of 440 pounds in the first six weeks of our program. That’s an average of 4.5 pounds per person. One half a pound per person more than the official records indicate. Our leading team, the Healthy Divas, have lost on average 8.6 pounds per person where our lagging team lost only .6 pounds per person. Both these teams have 9 team members, but the Healthy Divas started out weighing 345 pounds more, so they have more to lose. Rewards will be based on the percentage of weight loss and the Healthy Divas have lost an impressive 3.85% at the halfway point. Participants just reported their Week 7 weights and I was pleased to see an 82 pound loss. We had recorded disappointing numbers three weeks in a row, so it was great to see that we’re back on track. So although the midpoint statics showed a less dramatic improvement than I had hoped, I’m still encouraged. We will repeat all these screenings at 12 weeks when our Biggest Loser campaign officially comes to a close. At that point we’ll also be doing a blood draw to evaluate lipid panel and glucose.